Have you ever been on a time travel? 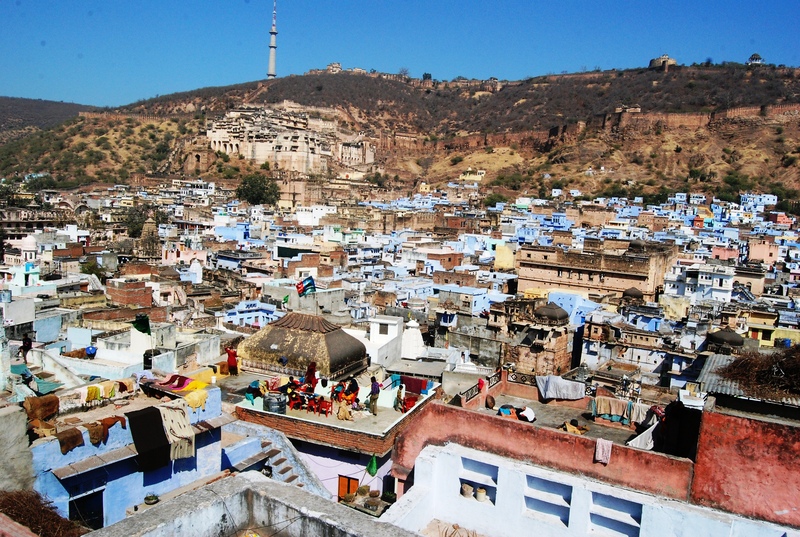 Well, I have….to Bundi, a small sleepy town huddled somewhere in the Hadouti region of North-west Rajasthan. Time has frozen in this town, inextricably caught in the web of history. No proper rail connection, no commercial establishment worth the name, dusty roads, vintage homes and havelis converted into lodgings; nevertheless this petite town remains attractive with the historical antiquity it is bestowed with. A small town spreading across the floor of the valley and straggling up the bare hills, with a lake in the middle and a fort looking down at it as a royal guardian; Bundi seems a miniature painting tucked on the horizon. 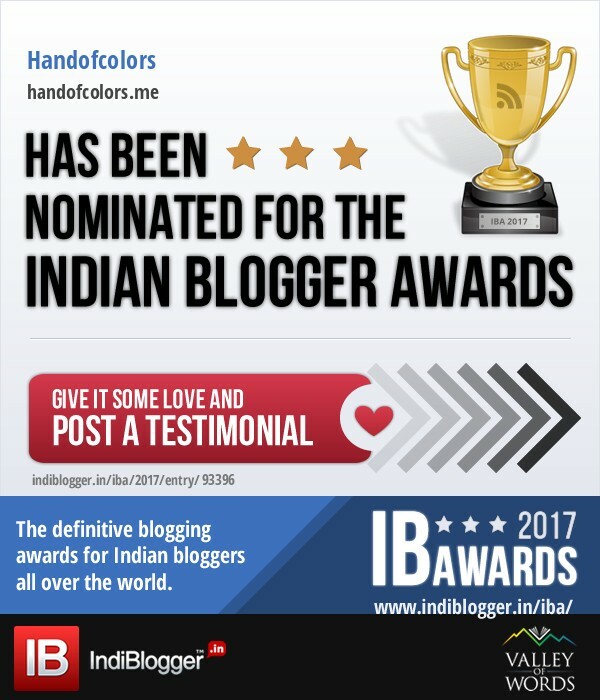 I reached Bundi early in the morning and headed straight to my hotel – Hadouti Palace tucked as a white nymph, in the middle of the town. The hotel is built in a colonial style and the doomed lobby of the hotel makes it spacious with natural light coming in from many windows. My room overlooked the city palace, shimmering like a jewel in the hills. The town looks isolated and independent, perplexing me one moment and exciting the other. 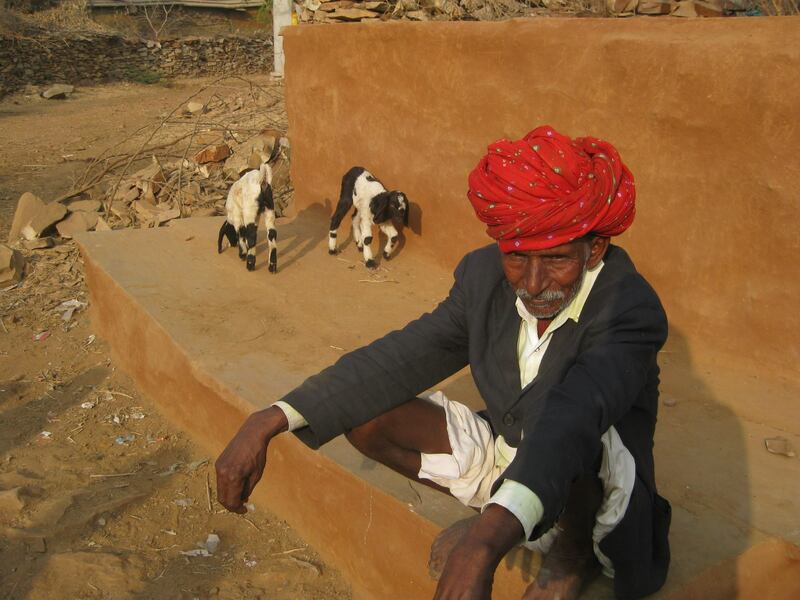 The town has a fairytale history; as the legend goes, back in the 12th century, restless young nobles of the warrior Chauhan clan vanquished the Bhil and Meena tribes of these lands. One group chose the neighbouring area of Kota, the other settled in Bundi. The actual marvel of this town is its architectural history, now stuck in a time wrap. ‘Seeing around places can be done on foot also’ the hotel manager told me. He forgot, I am a traveler not a tourist, I love exploring things. 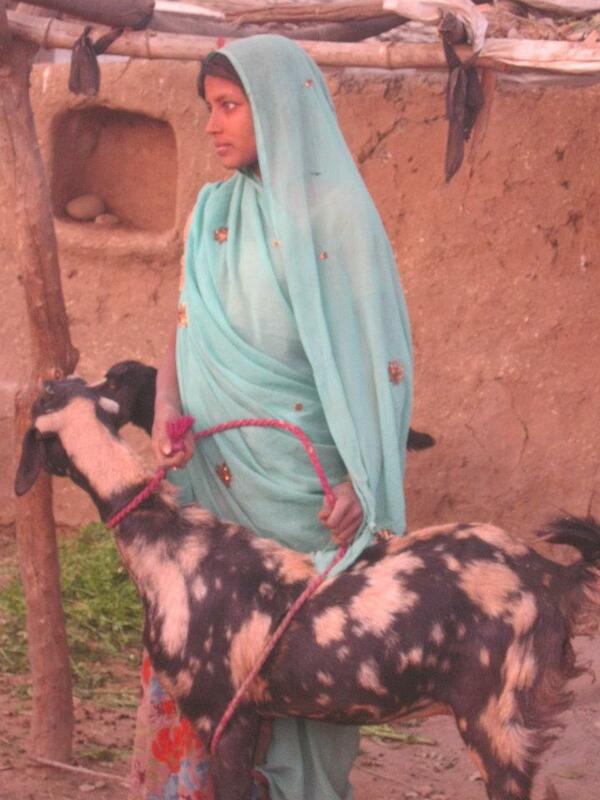 I contacted Kuki ji, an archeologist and guide, to take me to places hidden in Bundi. I was to be in his custody for two days. ‘Let’s see the city marvels first…’ he said and we proceeded to the Rani ki Baori, tucked in the middle of the town. Built by Rani Nathavati, in the year 1699, this 46 meters deep Boali is supposedly the deepest in the region. The step-well has a narrow entrance marked by pillars and elephant statues facing each other, and pictures some elegant carvings on columns and brackets. Bundi has its treasures strewn across the city. More you cover the city and drive through the countryside, more you will find the remnants of the Rajputana Empire that ruled this land. The neighbouring district of Bhilwara also stands as a Rajputana gift but is lesser known and less travelled by. Next I made my move towards the City Palace, massed across a rocky height, approached by flagged ramp. We entered through the Hathiya Pol, a tall portal surmounted by stone elephants so typical of Hadoti. Grand and elegant, only these words can define the city palace. A fleet of steps from the Hathia Pol leads to Rattan Daulat where a white marble throne stands. Another noteworthy apartments is the Chattra Mahal which has exquisite wall paintings of the famous Bundi Kalam. They have come a long way in making Bundi world famous for its miniature paintings. On the other side is Chitra shala, quadrangular with cloistered galleries running around it. It was established by Rao Raja Umed Singh in the 18th century and holds some of the best of Bundi murals. I was completely staggered by the quality of the art pieces. I walked past masterful depictions of life in the palace, painted predominantly in blues, greens, greys and delicate whites. Kukuji points out at some master-pieces, ‘a bored queen’ and a ‘justice loving king’. Once you come out, you need to climb another cobbled ramp to reach the crest of the Taragarh fort. Standing tall as a royal custodian, the fort commands a marvelous view of the plains of Hadoti towards the east, the lovely azure waters of Jait Sagar below on one side, the quaint town of Bundi on the other and the girding forests and hills all around. From there we moved to the famous Kipling’s house or ‘Sukh Niwas’, the summer palace of the erstwhile ruler, famed not only for the serene lotus-filled lake it borders, but also for its distinguished guest Rudyard Kipling. This is the place where Rudyard Kipling used to come to write ‘Jungle book’. I was curious to know more of Bundi, to explore it beyond its regal past. My guide Kukiji had assured me to take to some uncharted territories. No travel map suggests that there are two waterfalls in Bundi and one of them the Bhimlat waterfall was on our map that day. It’s a drive of about 2 hours from the main city through the Chitoor Road Chauraha, locally known as the khooni chauraha. It is said Bhimlat falls was created by Bhim to quench thirst of Pandavas while on Vanvas. Historical facts, however suggest that both Bhimlat falls and Menal falls (around 100 Kms from Bundi) were created due to 8th century earthquake. It is said earlier tigers used to walk within Bhimlat area and people could watch them from the top. Another 30 Kms and we were at Bijolia, an ancient temple town. Bijolia was part of the Mewar kingdom under the Parmar king and was later passed on to the Chauhan kings in the 12th century. The Bijolia tour will take you to Undeshwar Temple. A very unique thing about the temple is that it has its lower sanctrum under water. Other features include the spiraling pagoda and rich engravings on walls and ceilings. Another important attraction of the temple is the shikhar of the Ganesha temple, the chattaris or pavilions of the temple will leave you amazed at the dexterity of the architectural skill of that era. An archeologist in Kukiji brought me to Gagardha (30 Kms from Bundi), a small branch of River Chambal, an area where he has discovered rock paintings which belong to pre-historic age, showing life style of that era. We made another excursion to Rameshwar, where an ancient temple and some more rock paintings waited for us. After these excursions, it was time to return, through the same rickety roads that houses many shepherd communities, giving me countless moments to capture. We crossed Bhil communities and had our evening tea at their home, the typical spice laden, thick, sugary Rajasthani tea. We drove our way back to the main town, now wrapped in the cacophony of urban life. We halted at the main bazaar to have Bundi’s very own ‘dal bade’ and another religious halt at Bundi’s favourite juice stalls. In the evening, Bundi looks like an old, forgotten city, now with some fancy lighting system and randomly scattered street lights. I was back to Hadoti Palace, shining brilliantly on a silvery night. I had a brilliant menu set for me, starting with a round up to the vintage car collection, the hotel houses, then a well laid traditional meal and lastly off to late night movie in Ranjit Talkies, next to my hotel. Bundi is a story nursed by time. 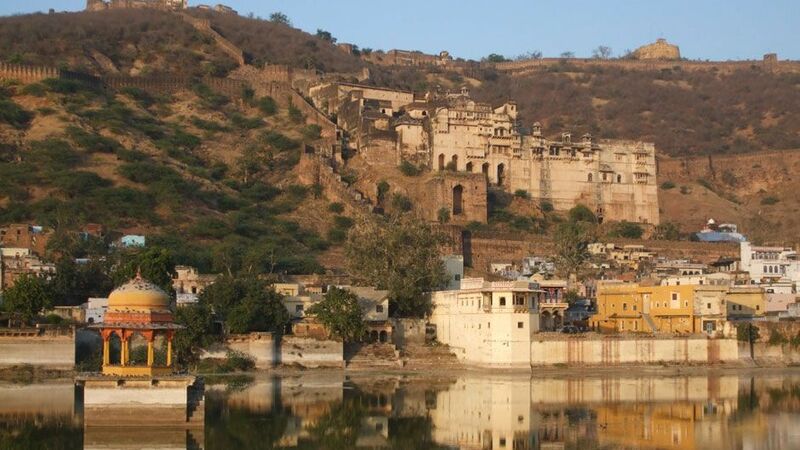 For all the bustle of the city, there is a timeless, trapped-in-amber, atmosphere about Bundi which, for many visitors is oddly reassuring in our ever changing world. To reach: Bundi is 40 Kms from Kota. There are two straight trains from New Delhi to Bundi or else Bundi can be covered via Kota. 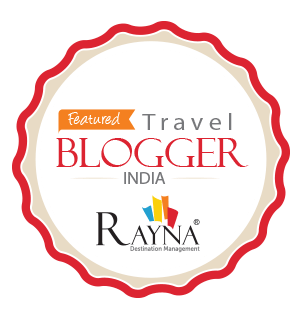 To stay: There are various havelis turned hotels in Bundi and the experience of staying in such properties is itself unique. Hadouti palace is also a good but a little expensive option. Bundi is no doubt a good place to go to. And try covering Kota from there.